Points on how to drive safely under the blue sky of Okinawa! Okinawa’s main form of transportation is a car. For most of the people in the city it is not often they drive outside of the city. When they do it is a luxurious time under the blue sky where they can enjoy nature and beautiful scenery. Because Okinawa is a car society, they have unique traffic rules and features that are different from other areas. 4 points to know for safe and comfortable driving! The roads in of Okinawa is slippery than the mainland! Have you heard of “Ryukyu Limestone?” It is limestone made from coral from the Okinawan sea. It has been used as a building material since ancient times that characteristics change as a result of changes in temperature and rain, wind, light. In Okinawa it is also included in asphalt for road paving. Due to the nature of the Ryukyu limestone, the surface of the road changes over time. It deteriorates due to direct sunlight and salt damage, and it gets very slippery when it gets wet from the rain. So be careful driving in rainy! Your car will often slip when starting to move. Be careful not to put too much pressure on the accelerator. And slow down gradually, don’t slam on the brakes! On Sunday afternoon, International street will be closed to traffic! International street is a road that many tourists travel. With the recent increase in traffic congestion due to the increasing number of cars, it was necessary to make travel restrictions. 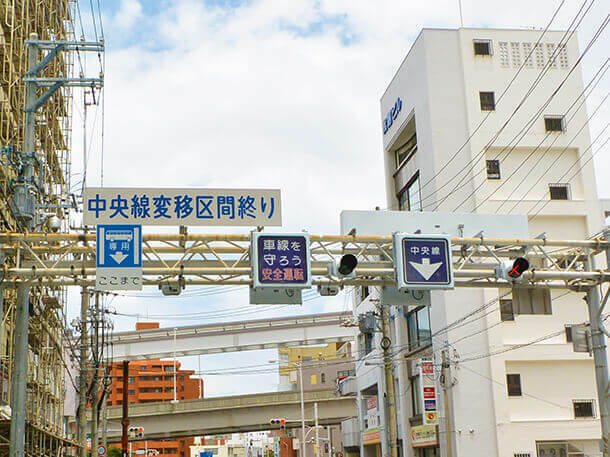 From noon to 6:00 p.m. every Sunday, the section from the prefectural government North Exit intersection to the Cai Warm Bridge intersection (Yui Rail Makishi Station) is closed to regular vehicles. During that time this section of International street it became a “pedestrian heaven” called the transit mall! At the mall there are Okinawa shows and mini live event, open cafes and wagon cart selling goods from neighboring shops. It is possible to pass only in authorized public transportation vehicles such as a bus. Also you can not cross International Street on Grand Orion street. And From Ukishima street to Paradise Street International street becomes a one-way street. At points where International road is open you can cross over it. However, you can walk across the road even if the road is closed. ※ “Transit Mall” may be closed in case of rain. Beware of bus lane regulations! In Okinawa, there is a lane dedicated to the bus line. 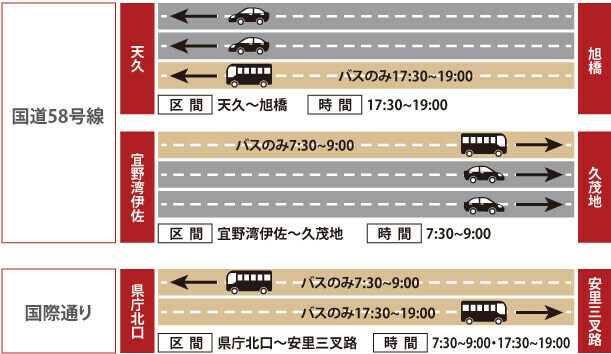 It is marked as a “bus lane.” In the morning and evening rush hour (7:30 to 9:00 a.m. and 5:30 to 7: 00 p.m.), The traffic of general vehicles is regulated so that bus driving schedule stays on time! The crackdown is severe, and even tourists who use rental cars can not pass! Restrictions are also being done in Naha city and along International street on Highway 58th which is frequently used by tourists, so be careful! When there are multiple lanes on one side like National Route 59, only the left lane will be dedicated to the bus. 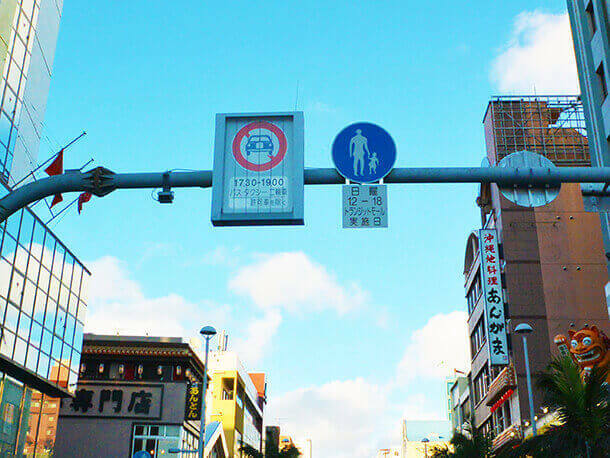 There are also roads that are restricted in Naha city, so please check with the road signs and drive carefully! 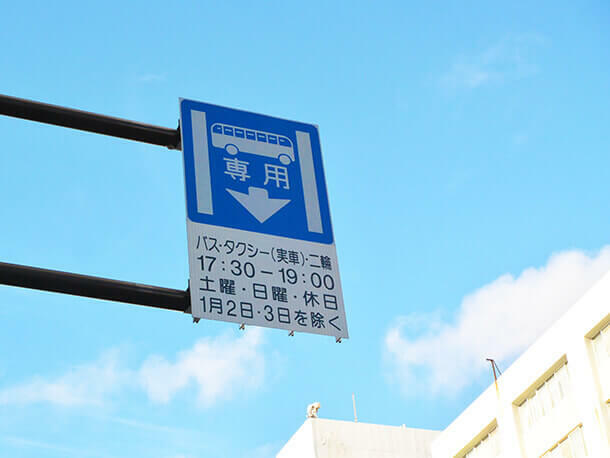 The bus lanes are marked with a “blue squared sign” on which a bus icon is drawn with the words “bus exclusive lane.”, Other traffic, such as taxis cars, and motorcycles, can not use the bus lane! When renting a car you can often get a map of the Bus Lanes. The center line changes at certain times! The center line that divides the road for 2 directions of travel changes at certain times. On roads with more than 3 lanes they will change the center lane so you can use it to travel in the direction of the main flow. This helps to alleviate congestion. This is not a popular practice in Japan, but it was adopted in Okinawa, (a car society). If you do not understand this practice properly there is a danger of a head-on collision. So, pay attention and follow the signs! Currently, this practice is implemented in the following three sections. There are dedicated traffic lights in these sections. Traffic is prohibited when the × light is flashing. There will be cars coming from the opposite direction in these lanes! At the beginning and the end of these sections, there are notation “center line transition section beginning” “center line transition section end” so do not forget to confirm! Because Okinawa has a lot of locals using cars, there are traffic regulations and precautions that aren’t often seen on the mainland. So it is important for locals as well as tourists to learn about and recognize these travel restrictions and regulations, so they can enjoy a safe and comfortable drive! Sightseeing power spots in Okinawa that you can enjoy by yourself!